Our set will make loops, rings, S, C, Z, L and just about any other shape. 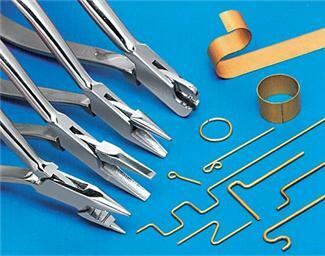 Set bends strip stock up to 1/32 inch thick and wire up to 3/32 inch. The strange looking plier at the top of the photo will even bend hardened music wire. Made of polished stainless steel with box joints that keep jaws in alignment. Orthodontists use these and pay about $34.00 each from dental supply houses. We buy directly from the manufacturer. The result is a set of incredibly useful, well-made tools at a great price. Click the button below to add the METAL FORMING PLIERS (SET OF 4) to your wish list.